Plantain can be used as a pasture mix for dairy cattle feed, but its properties have also been proven to reduce nitrogen loss. Game-changing new research into how plantain crops can reduce nitrogen loss from dairy farms will see Upper Manawatu farmers at the forefront of dairy science. In the Tararua catchment, dairy farmers are currently faced with reducing N loss from pastures by an average of 60 per cent, to meet the council’s One Plan targets. To achieve those, farmers are adopting a range of on-farm changes – and the region’s new plantain research could be a key component. 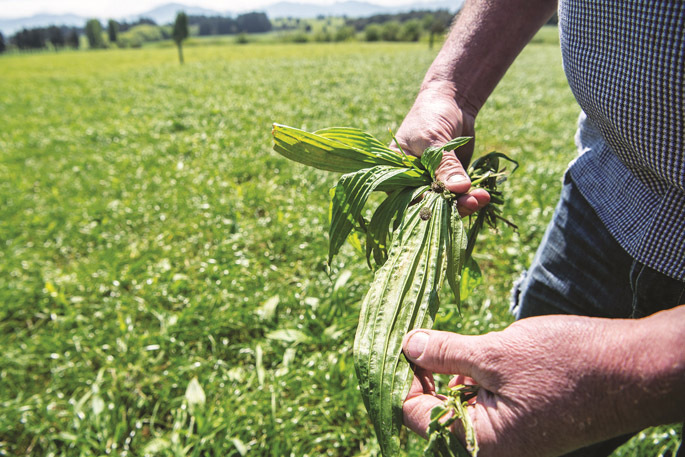 The Tararua Plantain Project, which recently secured funding through the Sustainable Farming Fund, is a new approach by DairyNZ to reduce farm N loss through a combination of plantain and good management practice. “The project is farmer-led and focuses on tangible, practical solutions to the environmental challenge by testing the feasibility of plantain at the farm and catchment scale. We’d like to see plantain as a staple part of the dairy cow’s diet in this area by 2025,” says Adam.